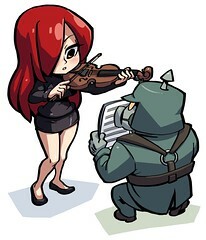 Michiru Yamane, famed composer of Castlevania: Symphony of the Night, will be scoring Skullgirls! Cool music i love jazz! she did a real good job! Music sounds good, really suits the level you guys have created. Holy crap, I didn’t even know Michiru Yamane was making music for you guys. This is so amazing! And it sounds as lovely as one would expect. Oh god, I can’t wait for this game. Good news! I’ve listened to the Symphony of the Night OST countless times, heh. sounds dope and it does fit the stage. i’m really looking forward to this game. This is some great music! Jazz definitely matches the whole Steam Punk Deco style for the overall game. I think jazz was a great choice.